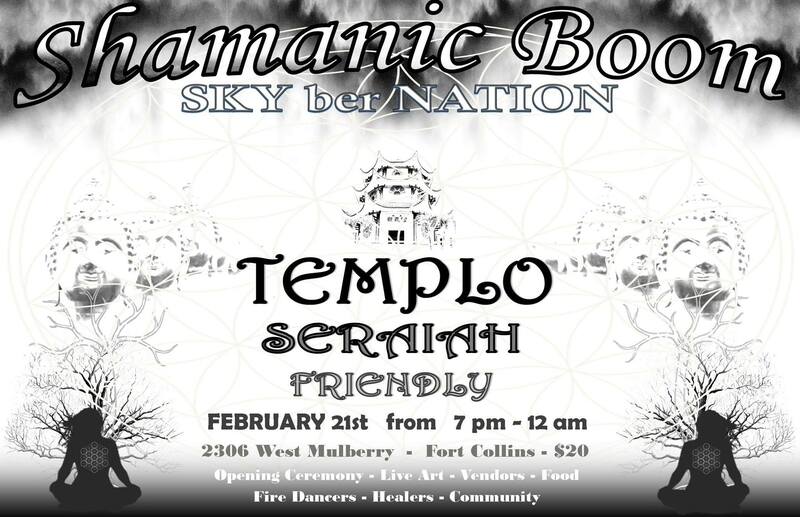 Top 5 reasons YOU SHOULD JOIN the Shamanic Boom community! Have I mentioned how much I LOVE SHAMANIC BOOM? Intention: each gathering begins with an opening ceremony that centers and unifies the community. Devine love & light has brought us here for a purpose! Comfort: The event is held in a historic building in a residential area. The floor is clean and safe to go barefoot on. There is a cuddle puddle to lay down and relax on. + Plus the amazing healing artist there that are happy to give you a massage! Dance Party: This party honors the phrase “keep the dance floor sacred” it is safe to spread your wings and fly, move, jump, bump, and shake your tail feathers here! Food: I don’t know of any sticky floor night clubs that serve the amazing nutritious and delicious FREE MEAL with ticketed entry. AMAZING ART: Music, Live Painting, Glass Art, Tea, Fire Spinning, and Healing Art. Each week is a little different but it is always a great showing of some of Colorado’s finest local art! The amazing Melanie Leithauser co- creator of Be Free Healing & Shamanic Boom!